I finally did this. I had a few people ask for a tute, it just took me a while to get to. 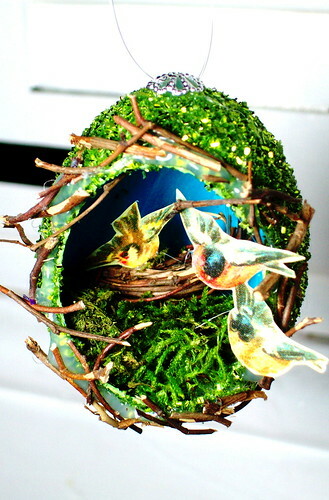 The ones I made for this are spring time egg ornaments,but you can make these for any holiday! 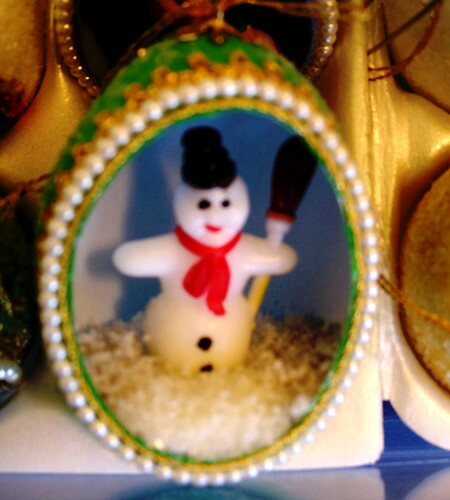 I have made Christmas ones and now these.. 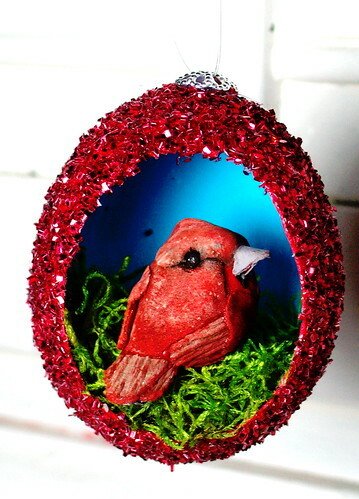 I have a ton pictures of all of mine and some Christmas ones that my grandmother made towards the end of this tutorial. -Moss, fake snow, gravel, etc. 5. 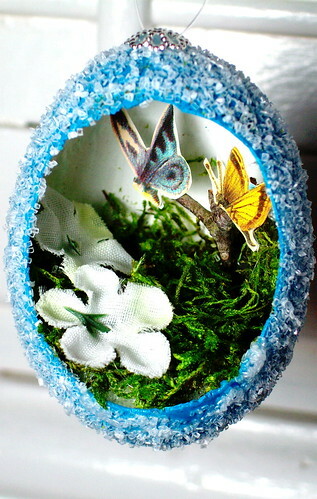 Paint the inside of egg and let it dry (I did blue like my grandma, but you could use a layer of white if you like). 6. Repaint the outside with another layer and touch up the newly cut hole. 8. 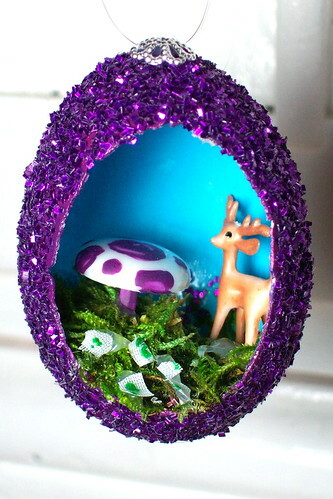 Using a paint brush, cover the outside of the egg with glue and roll that part in glitter. Let dry. 9. 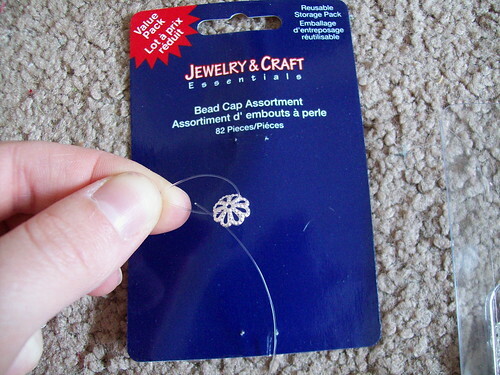 Add thread to bead cap (see picture). This will become how it hangs. 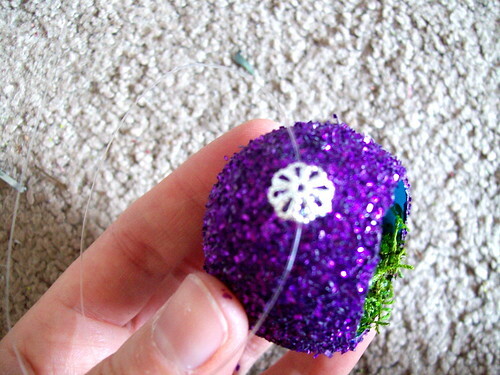 Using the hot glue gun, glue the bead cap onto the top of the egg. 10. Complete the inside. 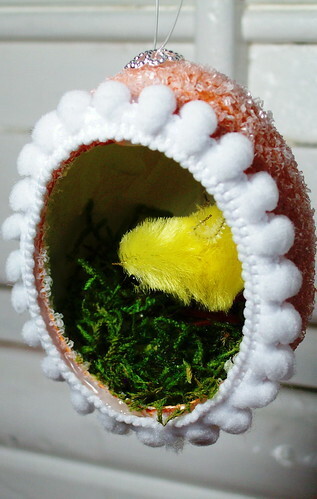 Take small pieces of Styrofoam and glue to bottom of inside egg. 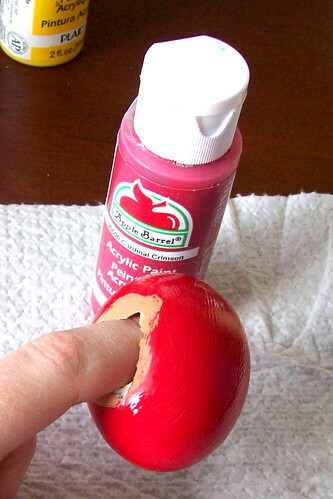 This will help to create a flat surface to glue things on. 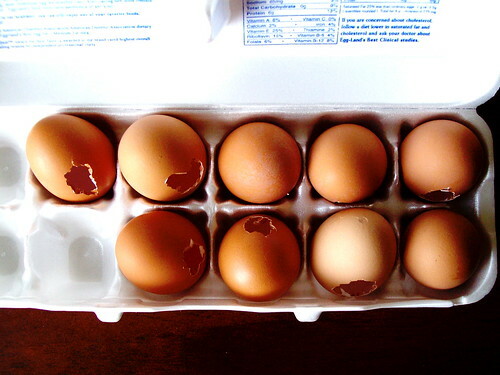 It might take some trial and error to cut the piece to fit each egg since they are different. 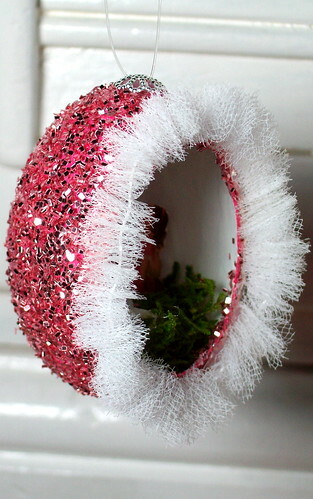 Once that is in, use tacky glue to glue on moss. After it dries for a bit, glue on miniatures with glue gun. 11. Glue ribbon, etc. around the outside edge of the opening. I suggest hot glue gun. Handle them with care. 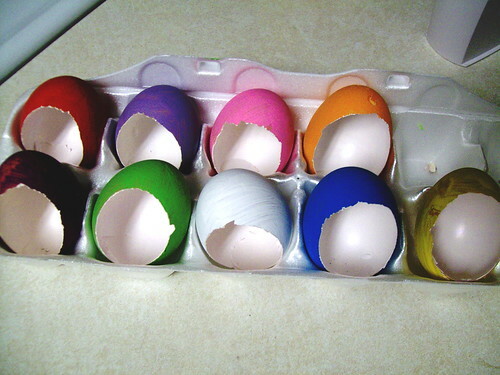 I recommend storing them in the egg cartons. these are amazing- thank you for sharing. Wow! 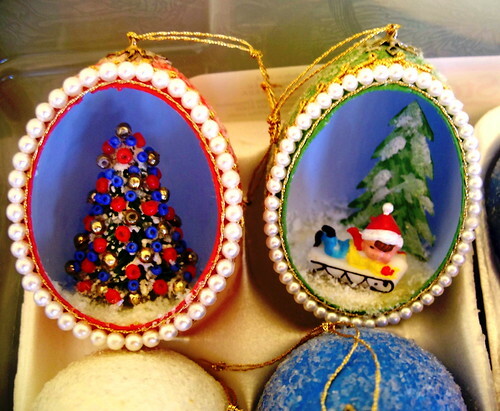 We had a neighbor who had made similar ornaments for our family over (45 years ago). I always loved them and won’t go into their demise… Thanks for this post! It will be on my “favorites”! Found you via Craftstylish. Holy Wow! I would love to post these on my blog – giving the oh-so-due credit to you and your creativity. Thanks everyone 🙂 I hope you have a lot of fun making them. I would love to see pics. Maybe I’ll start a Flickr group? 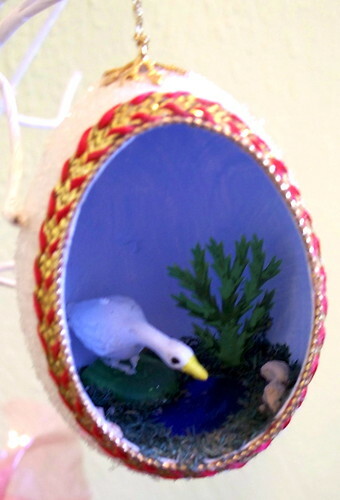 For new and old egg ornaments. These are so pretty and delicate! I love the bright glitter and cute scenes inside. 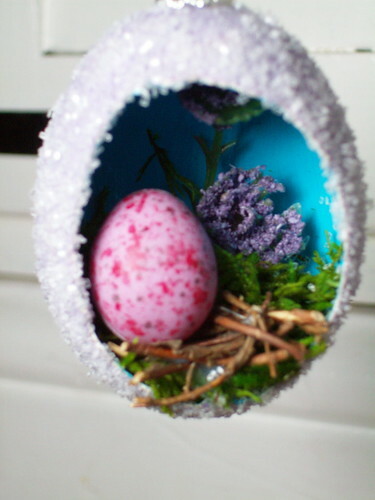 I am inspired by these and would love to try making them for Easter next year! These are AMAZING! 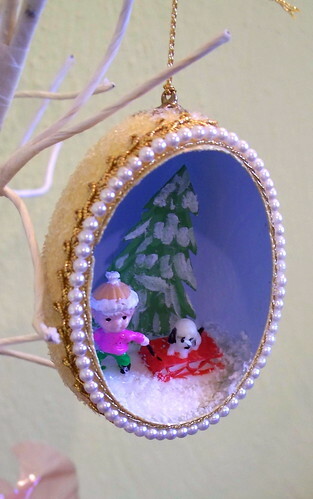 I am going to make one for my X-mas in July swap partner! Thanks so much for sharing! Little late to comment, but, yeah, wow, these are enormously dazzling bits of retro fantastic. I can’t imagine the patient handling required, but I’m glad you’ve persevered and taken the additional time for a tutorial. 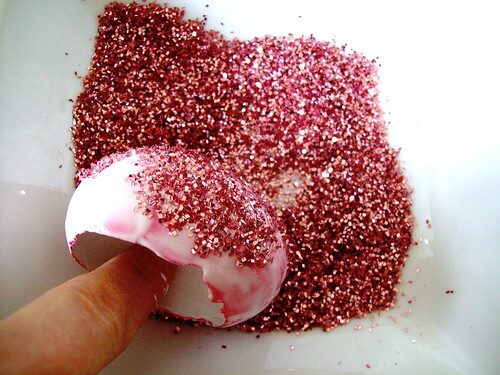 I definitely want to glitter something now. 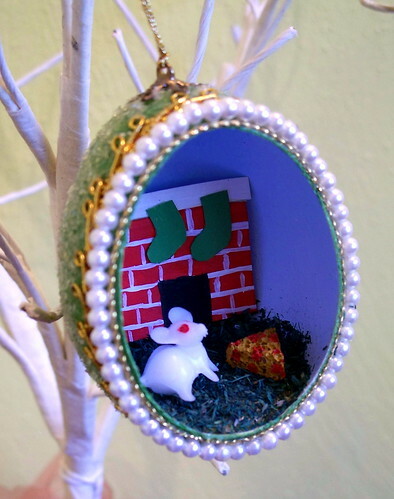 Preferably a hollow egg ornament. Thank you for the creative inspiration! inspiring! what wonderful little heirlooms you’ve crafted. really great idea. glad I stumbled across your blog. I’ve just spent the last couple of hours looking through your tutorials… absolutely fantastic stuff, you are a very talented lady (and pretty to boot!!) will definately be trying some of your tutorials in the very near future! 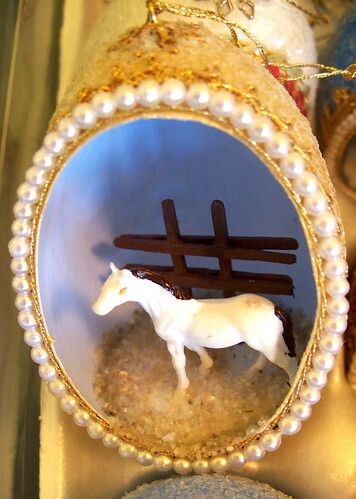 You have beautiful ornaments! 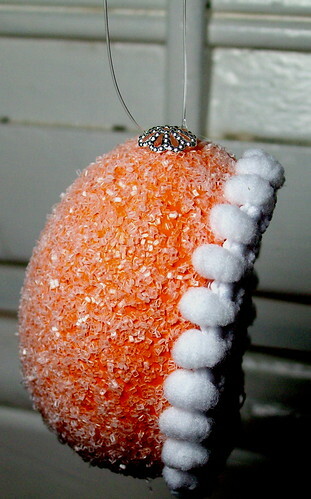 I remember my Best Friends Christmas Tree had egg ornaments with a photo of family members inserted into the egg touching the inside of the egg all around, rather than put over the surface of the egg. It was set in maybe 1/4 “. I can’t figure out how to do that. Any ideas? I really liked the shadow box effect it had. Hmmmm….. 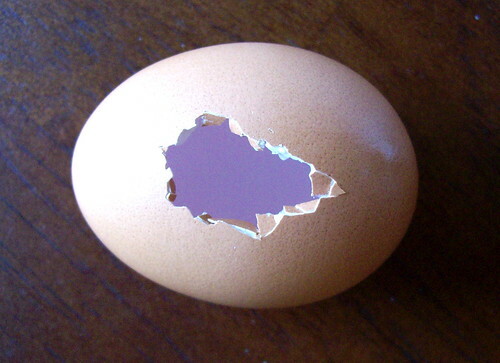 I guess if you cut it in an oval shape and glued it in the center of the egg it might work? Maybe try using a little bit of hot glue on the photo top and bottom, just a little, to hold it in place?? I went searching for a tutorial because I want to make some of these similar to what I had from my grandmother. 50 years later, and I only have 1 left on my tree. Thanks for sharing, this is perfect. LOVE THEM! 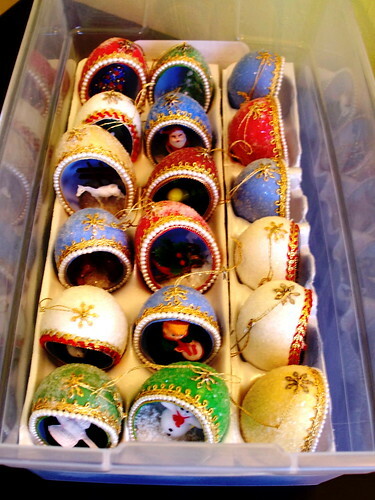 My dad and my grandma made these as a kid- but when i was younger (i mean, really young=]) and i broke them. Toats making them for him for xmas! Where did you get the mini figures for the inside of the egg? wow! Beautiful, definitely will be making some. Thanks for the tutorial. I was surprised to see your pin. My mom and I have been making these for over 50 yrs. They are my favorite craft to make Thanks. I love these, but, where do you find the little animals and such? 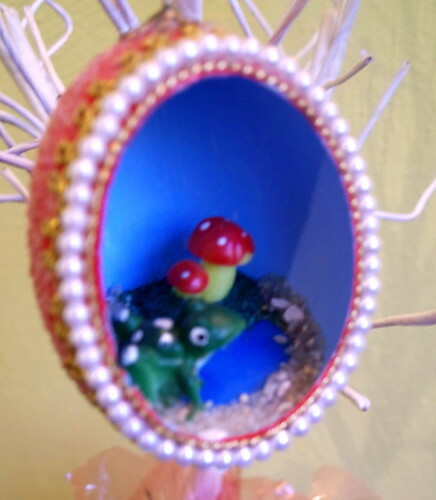 I used things that my mom had kept, so you could always look up “tiny vintage animals” on Etsy. 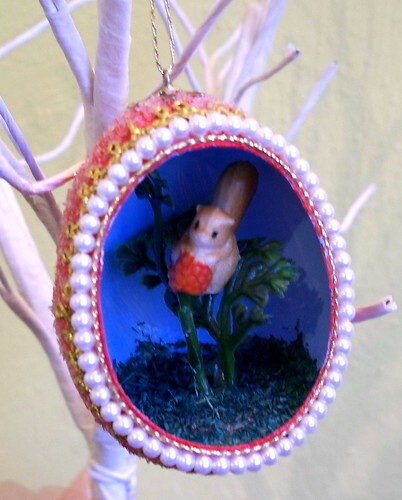 Also, I think if you look at the dollhouse areas at craft stores like Michaels and Hobby Lobby you can find miniature things to fit inside the egss. 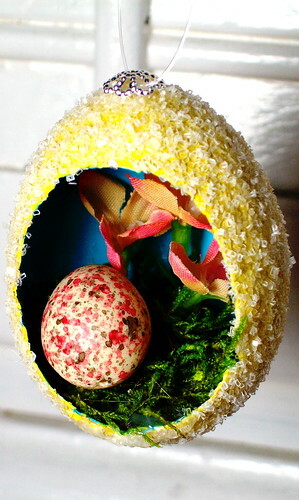 Where did you find what to put inside the eggs? I have been searching for months for small figureines. And I’m having no luck. 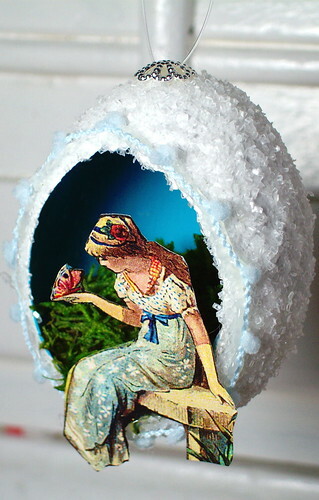 Well, my mom had some from when she crafted back in the day that I used and then I cut some things out from magazines. 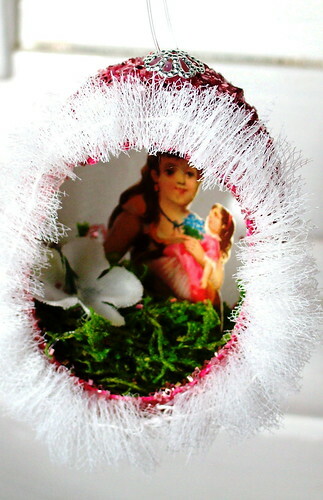 I would suggest looking in the areas of craft stores that have fairy garden or doll house items. They usually have some cute really small objects that would work. Also check out local thrift stores and vintage shops and maybe you might find some of the older mini objects. Hello! I have a weird question. 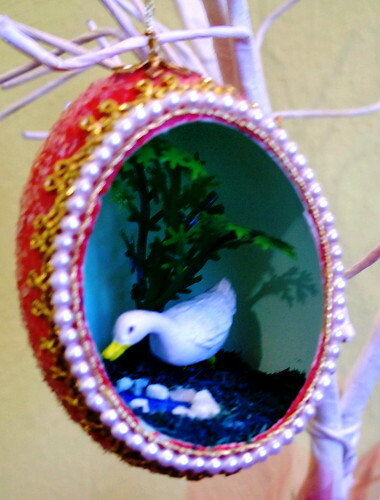 I’ve recently started blowing out my ducks’ eggs in hopes of learning to make ornaments, and I’m having a really hard time finding bead caps that are small and flat enough. Is there any chance you could tell me what you used? Hi 🙂 Well, I made these so long ago I have no idea lol But I had found them at Micheals I believe. I’m sorry I can’t be of more help. I hope you are able to find what you are looking for.